The 20-year effort to renovate the Dana Point Harbor passed an important milestone yesterday when Orange County Supervisors voted unanimously in support of a deal that partners the county government with a group of private companies. The proposal is to lease the harbor for 66 years into the future to a group called Dana Point Harbor Partners, LLC. Projects like this are referred to as a “P3” (public-private partnership). Formally, yesterday’s vote only granted the companies an option for 90 to 120 days in exchange for fees of $20,000 or $30,000; however, the decision included a full 245-page document that includes almost all the terms negotiated between the county and the new partners. The unanimous support from all five county supervisors is a strong signal that this project will move forward as described. Orange County Supervisor Lisa Bartlett called the three partners “best-in-class.” She described Burnham-Ward Properties as a best-in-class partner for the commercial core, Bellweather Financial Group as a best-in-class partner for the water-side improvements, and R.D. Olson Real Estate Group as a best-in-class partner for the hotels. Olson Real Estate Group, Inc. Ground Lease Agreement with Dana Point Harbor Partners, LLC. Drystack Lease Agreement with Dana Point Harbor Partners Drystack, LLC. 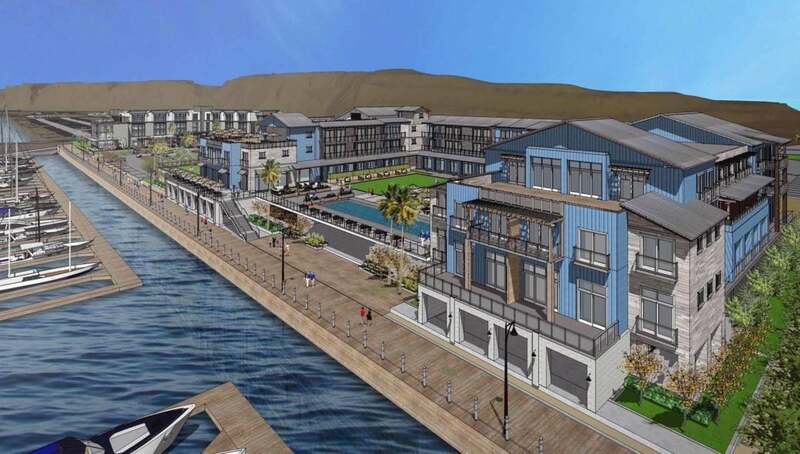 At the moment, the Dana Point Harbor revitalization plan includes a large-scale expansion of parking; building a new dry-stack boat barn; creating new buildings to house businesses and restaurants (referred to as the “commercial core”); renovating slips and docks (referred to as the “water-side” or “marina” renovations); and the construction of at least one hotel (probably two). (a) with respect to the Hotel, March 1, 2023 for the “affordable” hotel, and, if built, March 3, 2025 for the “boutique” hotel, (b) with respect to the Commercial Core, January 1, 2021, and (c) with respect to the Marina, January 1, 2022. (a) with respect to the Hotel, July 30, 2027 for the “affordable” hotel, and, if built, July 30, 2027 for the “boutique” hotel, (b) with respect to the Commercial Core, December 31, 2024, and (c) with respect to the Marina, December 31, 2027. By the terms of yesterday’s agreement, the Dana Point Harbor Partners group will have 90 to 120 days to finish negotiating any outstanding deal terms within the agreements. There has been some criticism of the financial projections associated with this plan, in part questioning whether the whole of Orange County should pay for a harbor located only in Dana Point, and in part related to the runaway, massive cost of operating the Harbor Patrol. Supervisors responded that the Dana Point Harbor, like the John Wayne Airport, is a large public asset servicing the whole of Orange County and not limited to any single district. Several supervisors acknowledged that questions about funding the Harbor Patrol in the long term are “legitimate” and amount to nearly $1 billion of the noted $1.2B potential shortfall. Supervisor Bartlett added that the Dana Point Harbor Patrol is “trained at the homeland security level. You don’t need a homeland security-level person necessarily telling someone to put their life vest on.” The topic of the Harbor Patrol is currently being evaluated by Orange County CEO Frank Kim and is likely to come before the supervisors again for discussion. Requests from the public to include local boaters and merchants in the finalization of the agreements seemed to be well received by supervisors, with Lisa Bartlett specifically asking the county staff to circulate the option agreement among stakeholders like Dana Point Harbor Merchants Association, and the Dana Point Harbor Advisory Board. A long-time Dana Pointer, technologist and publisher, I have been involved in several initiatives around Dana Point over the years ranging from environmental issues to civic planning. Fueled by coffee.